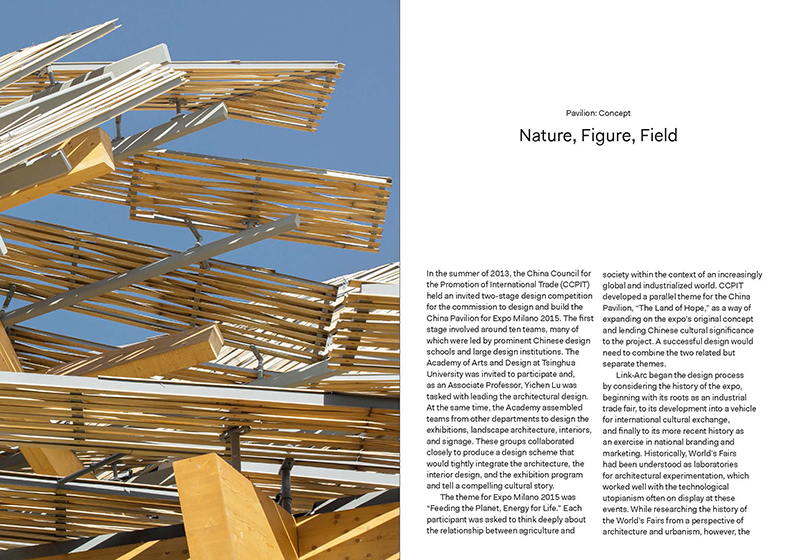 In May 2015, Studio Link-Arc completed its most prominent work to date, the China Pavilion for Expo Milano 2015. The project was China’s first free-standing Expo Pavilion outside of its own borders. XPOSITIONS is not conceived as a monograph that focuses on one project. 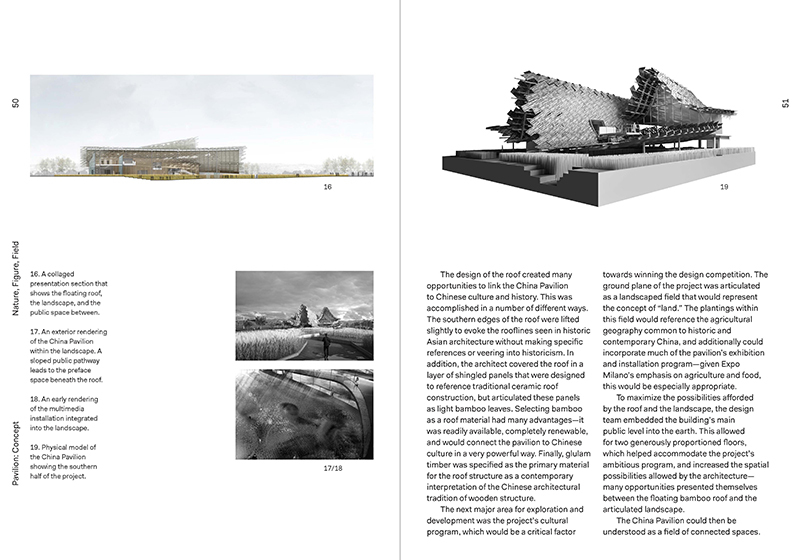 Instead, it carefully examines the larger ideas woven into the design of the China Pavilion and explores their implications for design and global culture. In addition to presenting the story of the project—from conception through construction and occupancy—the book addresses the larger design forces at play via discussions with key figures in the architecture community: Stefano Boeri, Xiangning Li, and Daniel Libeskind. One of the most photogenic pavilions at the Expo 2015 in Milan was the China Pavilion designed by the Academy of Art & Design, Tsinghua University and New York's Studio Link-Arc. The team conceived of the pavilion as "a field of spaces located beneath a floating cloud." The roof, serving as the cloud surrogate, was the most striking formal aspect of the pavilion, undulating gently toward the Expo's main circulation spine and stepping sharply, like a city skyline, at the other end. 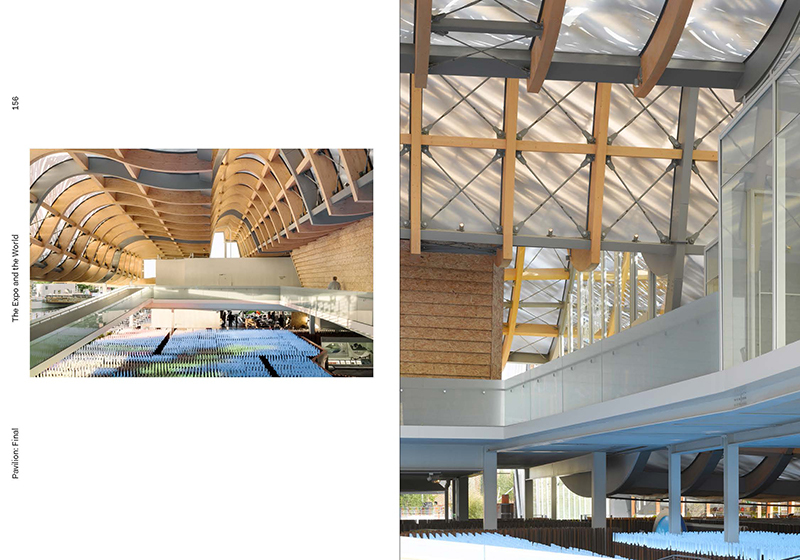 Made of latticed bamboo panels above glulam beams and a translucent membrane, the roof filtered light to the spaces below, which consisted of cultural, dining, and other functions. The careful balance of complex formal geometries and more traditional materials (wood and bamboo), as well as the fact the pavilion was up for only six months, warrants a book-length case study to explain the design process to those who did and did not attend Expo 2015. Edited by Original Copy, XPOSITIONS is a two-part narrative told in four acts. 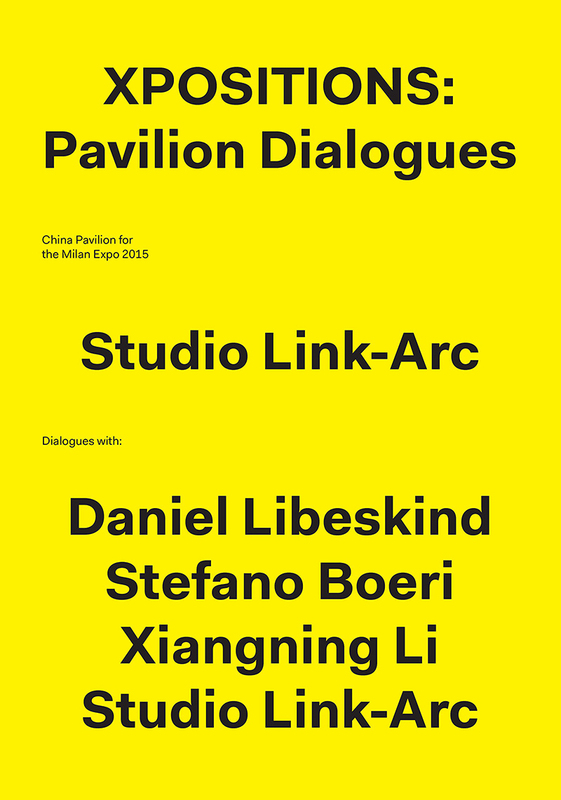 One of the two intertwining parts is "Dialogues," interviews with Studio Link-Arc as well Daniel Libeskind, who designed a pavilion for Vanke at the same Expo; Stefano Boeri, who worked on the masterplan for the Expo; and Xiangning Li, who curated the Chinese Pavilion at the 2018 Venice Architecture Biennale. 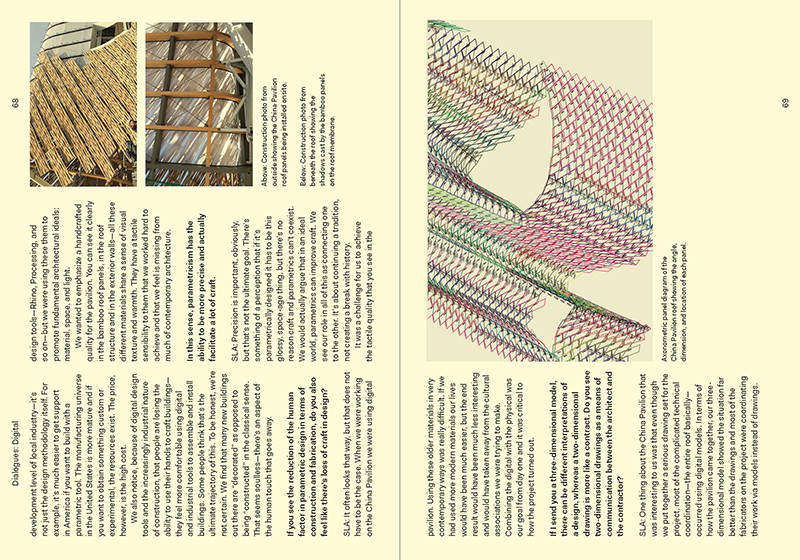 These interviews -- turned horizontally on the page, apparent in a spread below -- are split into four themes: borders, digital, time, and place. Alternating with them is the second part: "Pavilion," Link-Arc's documentation and explanations of the competition-winning concept, the development of the design, the pavilion's construction, and its final state. An appendix includes drawings, a timeline of the project, and data on the pavilion and its design team. The whole is thorough, insightful, and handsome, making me wish I would have experienced the pavilion during its all-too-brief run on the outskirts of Milan. Studio Link-Arc is an international team of architects and designers based in New York, led by Yichen Lu, Principal and Associate Professor at Tsinghua University.